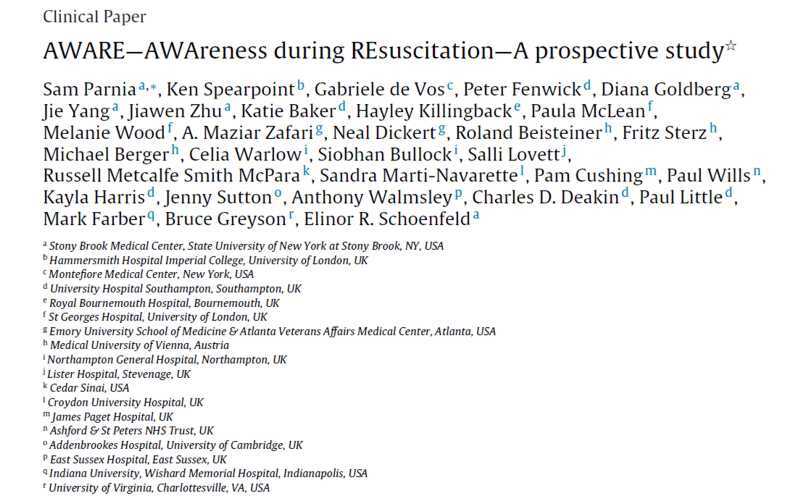 Years of dedicated work by Dr. Sam Parnia and his colleagues have finally resulted in the publication of the AWARE study (AWAreness during REsuscitation) of the nature of consciousness during cardiac arrest and resuscitation. It was published at the end of 2014 in the international medical journal “Resuscitation”, with the journal reference: Parnia, S, et al, (2014), AWARE—AWAreness during REsuscitation—A prospective study. Resuscitation, 85: 1799-1805. Interested readers can download the article by clicking on the link HERE. The title page of the article reveals much about the nature of this study. The title, the numbers of participating institutions and physicians, the methodology, as well as the analysis, reveal this to be a landmark study requiring enormous persistence and effort on the part of Sam Parnia. This wonderful study is a credit to Sam Parnia, his co-workers, and the participating institutions. It finally provides data about the possibility, and nature of consciousness during cardiac arrest and massage in an independent multinational study. Many people believe it is impossible for the human brain to be conscious during cardiac arrest and resuscitation (see extensive discussion of this belief by clicking HERE). 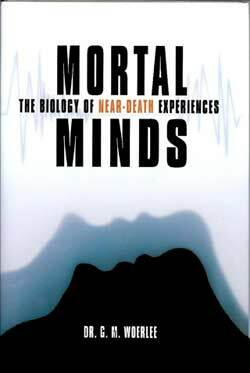 Furthermore, associations such as the IANDS (International Association of Near Death Studies), and many people writing books on the subject of near-death experiences, believe that human conscious is not a product of brain function, but that the body and brain are merely the conduit for a consciousness outside the body (see extensive discussion of this belief by clicking HERE). So many of those believing in the reality of this extracorporeal nature of consciousness believed the AWARE study would finally provide confirmation of the reality of the extracorporeal nature of consciousness. But is this true? What do the results of Sam Parnia's AWARE study truly reveal? The AWARE study was performed in several countries according to an identical fixed protocol. It is a study whose structure ensured a critical and accurate study. So let us look at some of the important statistics. 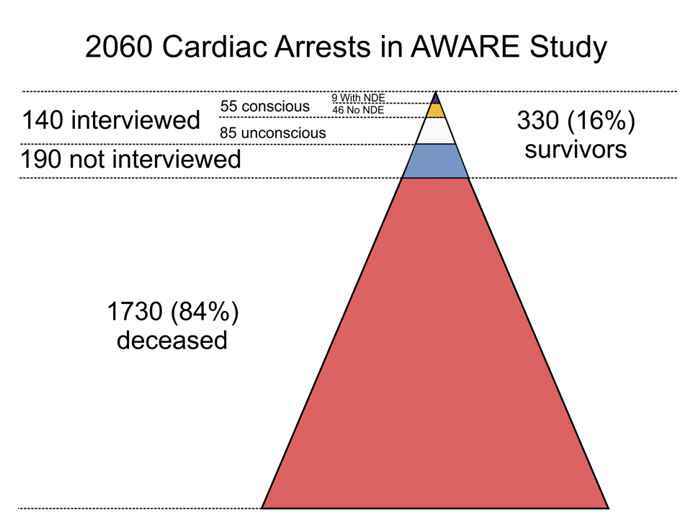 Consciousness with detailed memories during cardiac arrest, but no NDE, was reported by 46 out of 140 interviewed survivors = 46/140 = 33% of interviewed survivors. Consciousness with detailed memories during cardiac arrest, associated with an NDE, was reported by 9 out of 140 interviewed survivors = 9/140 = 6.4% of interviewed survivors. We simply do not know whether the other 2060 - 140 = 1920 persons who were not interviewed, were conscious during cardiac arrest and resuscitation! They were either dead, too brain damaged, too ill, or refused interview. Accordingly, to say that 39% of ALL persons undergoing cardiac arrest and resuscitation experience some sort of consciousness is incorrect. Likewise, to claim that about 6% of ALL persons undergoing cardiac arrest and resuscitation experience a near-death experience is also incorrect. We CAN say that the AWARE study indicates that consciousness occurs quite often during cardiac arrest and resuscitation. Nonetheless, even when these limitations are taken into account, the AWARE study of Sam Parnia and his co-workers remains a landmark study: finally demonstrating to physicians, that many people undergoing resuscitation for cardiac arrest may actually be conscious, even though they appear unconscious, and neither breathe, nor have any heartbeat. Sam Parnia and his colleagues were at a loss to explain the presence of consciousness in persons suffering from cardiac arrest. This is clearly revealed in the discussion of their article. Actually physiology explains the presence of consciousness during cardiac arrest very well. 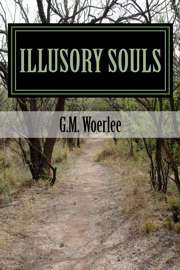 The physiology of consciousness during cardiac arrest is explained extensively in Chapter 12 of the book Illusory Souls, as well as more succinctly in the website HERE. The physiology of cardiac massage in humans and the 140 year-old “Fick Equation” as explained HERE, explain that significant numbers of people will have a blood pressure and cardiac output consistent with consciousness while undergoing manual cardiac massage! Furthermore, it is possible for people to undergo a near-death experience in the few seconds of consciousness remaining while losing consciousness due to cardiac arrest. For example, a classic example of losing consciousness due to cardiac arrest was described by a woman in the book “Life After Life” by Robert Moody in 1976. It is surprising that this article does not even mention these long-known and recognized possibilities. And this brings us to the really very substandard discussion of the results. The discussion of the results is in some aspects substandard, and totally ignores the reality of human research performed since the 1960's. This passage in particular�. Sam Parnia is telling us in this passage in this passage is that conventional external heart massage cannot supply the brain with sufficient oxygen to restore or sustain consciousness. He does use the term “usually”, and then negates this entirely by saying that heart massage generates insufficient blood flow to meet brain oxygen requirements. He provides references to scientific articles to support these contentions. So let us examine the articles he lists. These are references 22 to 25. Are these articles relevant to his discussion, and do these articles actually support his contentions? Let us examine them. Do these studies support his contentions? The answer is yes, and no. They are animal studies performed in a manner very different to normal clinical cardiac arrest resuscitation practice. What these studies do demonstrate is that the longer the period between arrest and resuscitation, the more brain damage occurs, which is relevant to human practice. Nonetheless, Sam Parnia totally ignores human studies demonstrating that efficient cardiac massage can provide sufficient blood flow to the brain to support consciousness, and that a small percentage of persons are even clearly awake during efficient cardiac massage. Furthermore, he generalizes from averages, and applies an average to all. This is a cardinal error. There are always a few who rise above the average. These exceptions do not negate the average, but are simply those who are at the outer limits above and below an average. Sam Parnia's study reveals that cardiac arrest is a very lethal event, and that only a few people survive relatively intact. This could even be called “The Pyramid of Death”. The above diagram of the “The Pyramid of Death” showing the statistics of the Sam Parnia Aware study reveals in no uncertain terms how rare the occurrence of an NDE during cardiac arrest is. This is a clear demonstration of how few people suffer cardiac arrest under optimum situations where they are efficiently resuscitated, are conscious during arrest, and even retain normal neurological function. These people are rare, but this does not mean that anything inexplicable, or paranormal is occurring, as is implied in the discussion of Sam Parnia. In fact the physiology of cardiac resuscitation, and the Fick Equation predict that some people will be conscious, and possibly even undergo an NDE during cardiac arrest and resuscitation. It provides further recognition of the fact that people may be conscious, even though they appear unconscious during cardiac massage. This explains the well-known “Dentureman” near-death experience. (click HERE to read a detailed study of this experience). It reveals the physiological nature of consciousness during cardiac arrest and massage. It reveals that a significant percentage of people may experience consciousness during cardiac arrest and resuscitation.